Of the greater predators in the great green forest of Gdera, suras are probably the largest - animals that are bigger still usually are herbivores. Suras are six meters long without the tail, and have a powerful jaw. 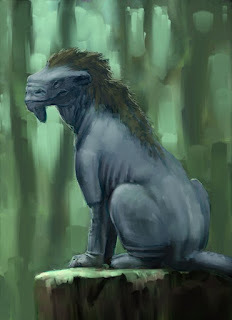 Their thick, saggy, blue-grey skin has a small mane of greenish brown fur. Hunting sura is dangerous and needs well-trained surabans to accompany the hunters; but several parts are considered delicacies, and the skin is a great trophy. Suras are perfectly aware of their place at the top of the food chain, and are often impolite to travellers by striding into camps, taking food and scaring pets. But, suras will not usually openly seek trouble, and the greatforesters have taken to wearing sura bells; small bundles of bells worn at the ankle, to announce themselves to the predators and make them take a different route. Suras are true to their homeland and easy to expect. "Our nearest neighbours exiled their head hunter last year. It turned out that she had not, as she claimed, hunted and killed the sura alone, whose skin she wore; but that she had bought it from nomad traders. Sentries say she made a hut up on the fallen sky fig; we tell the children to stay away from her." Suras aren't even that important (but how can any animal be, when there are so many), they are mostly the reason for a local custom of wearing bells to make suras go elsewhere. I do believe however, that some animals will quickly learn that bells in the forest mean food, toys, and easy prey. And the choice between meeting a sura, and being pestered by nureewings may just go the way of not wearing bells; at least suras don't attack without provocation.